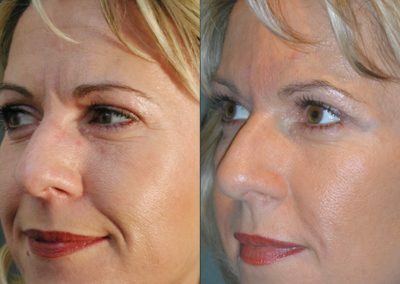 If wrinkles do not disappear even after weakening the disturbing facial expressions, so-called hyaluronic acid fillers can be used. These are injectable substances that are tolerated by the body but are completely broken down after about 12 to 18 months. Hyaluronic acid has proven very useful as it is available in different solid consistencies. Like collagen, hyaluronic acid is an essential component of connective tissue. Dr. Dr. Muggenthaler uses only synthetic non-animal hyaluronic acid, which has an extremely low risk of infection and allergy. We advise you in detail which type of wrinkle treatment shows the best results for you. According to the latest findings, hyaluronic acid also binds free radicals, which means that aging damage can be reversed. Visible and noticeable unevennesses that are not self-evident may require a limited amount of post-correction. In very rare cases, pronounced swelling and discolouration may last for about two weeks. 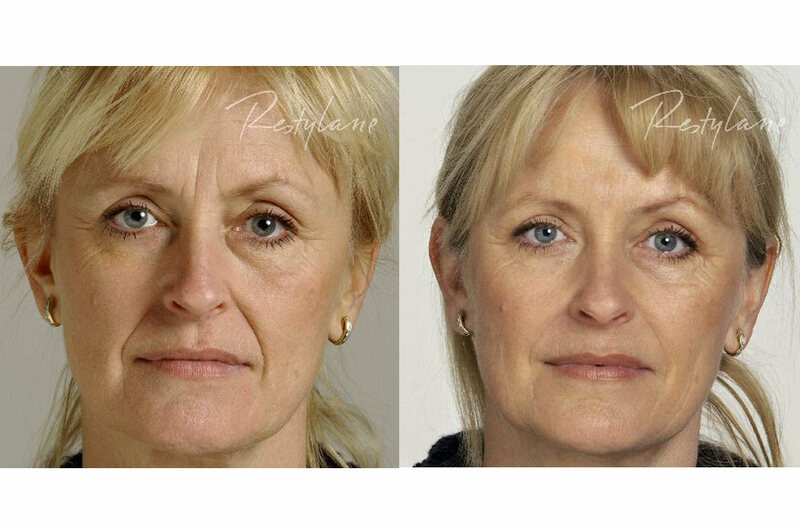 Smoothing the frown lines with a RESTYLANE relining. Depending on the requirements of the specific treatment, hyaluronic acid of different concentration and viscosity is used. Injection with hyaluronic acid provides stable results for 12 to 18 months. 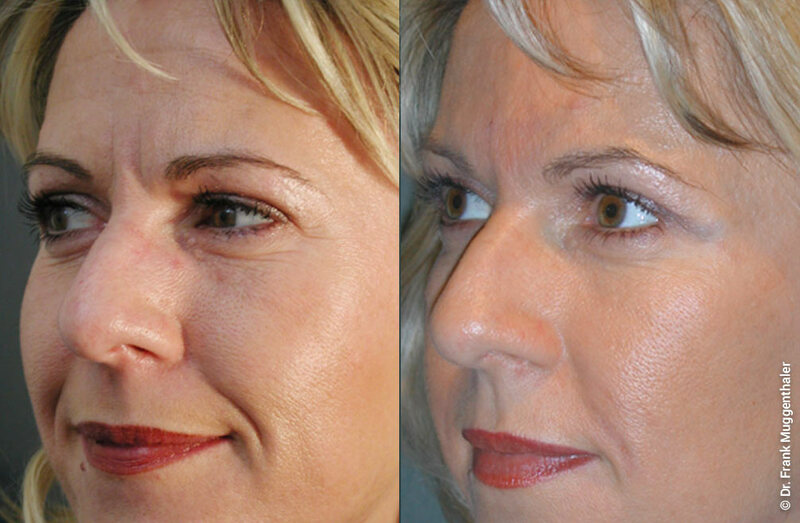 Dr. Muggenthaler analyzes your face at the beginning of a Filler treatment. In addition to wrinkles, the underlying facial expression and the general proportions of the face are decisive for a natural facial expression. Since all mimic muscles of the face are indirectly interconnected, weakening at one point very often has an effect on distant areas of the face. We take this into account in the detailed analysis and discuss your wishes and the possibilities with you. For large-scale refreshments of the facial skin, non-crosslinked hyaluronic acid is used, which is applied superficially. Fine wrinkles can be compensated with low-viscosity cross-linked hyaluronic acid of small particle size. Deeper wrinkles are treated with more crosslinked hyaluronic acid, with different particle sizes available to achieve an even longer shelf life. For the construction of the cheek and chin profile preparations with very large particle size are offered, which cushion from the depth and model the face profile. A special hyaluronic acid is suitable for lip contouring, in which the individual particles are rounded off and are thus intended to adapt better to the curvature of the lip. In the meantime one can fall back on a broad product range. We use only synthetically produced fillers of non-animal origin with an extremely low risk of infection and allergy. In which skin layer is the hyaluronic acid injected? Depending on the indication and condition of the filler, directly into the epidermis (low-viscosity fillers such as TouchTM or VitalTM). In the layer between epidermis and dermis or even over the periosteum. Fillers are placed in all layers of the skin, depending on the indication and consistency. At MUGGENTHALER ÄSTHETIK we rely on the proven product range of the Swiss company Galderma. Very rare: hypersensitivity to hyaluronic acid. If suspected, an allergy test must be done beforehand. Extremely rare in especially allergic people. Does sunscreen help to keep the result longer? Yes, because the free radicals also break down hyaluronic acid. Can I do sports after the treatment? Not until the next day. How effective are hyaluronic creams compared to a filler treatment? You can’t compare. Creams only lead to an increased hydration of the upper skin layer (horny layer), Certain smoothing, wrinkles are not treated by this, if at all, only superficial wrinkles are smoothed for a while. What does liquid lifting mean? 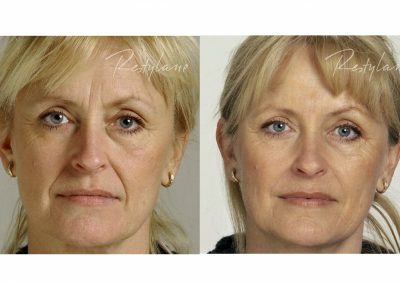 Liquid Lifting is a concept of facial rejuvenation that aims to completely compensate for volume loss and displacement by replacing with hyaluronic acid. Although it makes sense to a certain extent to compensate for volume loss, it is of course not possible to really lift the sunken sections. It is advisable to use hyaluronic acid in combination with a lifting or to offer it as a supplement. 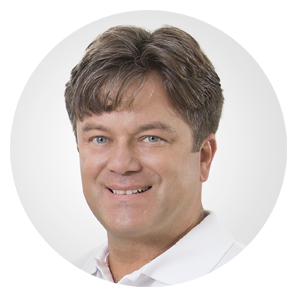 Dr. Muggenthaler is convinced of the treatment with hyaluronic acid, but also knows the limits of the method. If an excessive use of fillers would build up the face too much, it would not result in any youthful facial features, but rather in a disfigurement. Therefore, we strongly recommend a cautious application. For harmonious results, certain limits of reason must not be exceeded. The most frequently asked questions about the treatment with hyaluronic acid are answered by Dr. med. Frank Muggenthaler on this page. Can’t find an answer to your question here? Then get in touch with us! We will answer all your questions, gladly in a personal consultation in our practice in Basel.